There are many people who travel around the world to do business. Such people need to have the best deal when it comes to options that are available while traveling in business class flights. So, it becomes very necessary that an apt air consultant is chosen and the right flight booked to reach in time for completing business dealings. When people travel to do business, the business class flights are the best as they are saved from paying high fares for first class travel and are also eliminated from enduring the difficulties of an economy class. The benefits of traveling business class would be that you would have all the facilities and would be fresh to deal with your work the following day of travel. 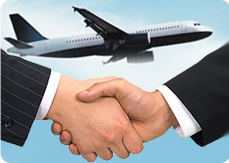 The best air consultant would be the provided by the best air travel agency. They would be able to help you find the most suitable airline, the best flights and the most convenient time for flying.The consultant should be able to give you all the options available as far as fares are concerned for the different flight options available.The consultant would also have to give you the flights available on those dates and the timing of the flights, so that it suits you. The rates should be affordable. Air consultants should ask you the right questions to facilitate the best service. Different air consultants would be specializing in different fields. Some might be specializing in international travel while others in domestic travel. Some might give you the best in business class flights while others might be best in luxury or first class travel. Whether you would prefer a non stop flight or flights with stop over (if that is cheaper)? The time when you want to take the flight? If you are willing to travel a day earlier and return a day later if the fares are cheaper? Whether you have a preferred airline? If you are frequent flyer, if so, the number and the benefits that you have? Seating and dietary preferences, if you have any? What is the payment procedure your prefer? Would you prefer rental car, accommodation and a limo transfer? A good air consultant will be ready to spend time finding out your needs and catering to your tastes and will not be trying to thrust the travel products on you. A travel agent who is not that good will focus on the travel product and not on your needs. The air consultant should be knowledgeable about the travel that you want. If he is not sure, he should put you on to someone who knows about traveling in that area of the world. The air consultant should have good contacts, to enable him to get the best deals for the people who are traveling business class to ensure that they get to travel to their destination with ease and also have the whole package that is the best and most affordable. Choose an air consultant that can be contacted easily, whenever need arises. You should be comfortable dealing with him. You should also be able to see if he gives you all the options available for your flight requirements or restricts himself to some of them. After opting for the best air consultant, see that you pay him well for the services that are rendered. You will get the type of service that you pay for. If you pay well, you will also get the best service. Always choose an air consultant who will not only be the cheapest but who will be aware of your needs and will be able to match the travel plans accordingly.